You can save a picture of someone's words and capture a funny or important moment with a screenshot of your iPhone. You've probably noticed, though, that there's no button or pre-installed app on the iPhone for taking screenshots. That doesn't mean it can't be done, though. You just need to know the tricks you'll learn in this article. The instructions in this article can be used to take a screenshot on any model of iPhone (including the iPhone X and XS/XR), iPod touch, or iPad that's running iOS 2.0 or higher (which is basically all of them. That version of the iOS was released in 2008!). You can't take screenshots on iPod models other than the iPod touch because they don't run iOS and so don't have that feature. Taking screenshots on the iPhone (and iPod touch and iPad) is done by pressing a combination of buttons at the same time. What buttons you press depends on what model phone you have, as we'll see. 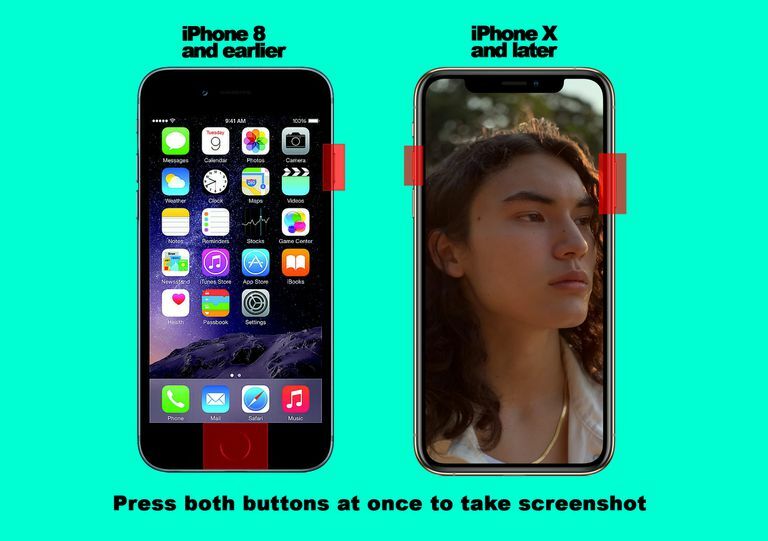 For many years, iPhone screenshots involved using the Home button, but Apple removed that button from the ​iPhone X and later models like the XS and XR, as well as some models of the iPad Pro. Don't worry, though: the process is still easy if you follow these steps. Begin by getting whatever you want to take a screenshot of onto the screen of your iPhone, iPad, or iPod touch. This could mean browsing to a particular website, opening a text message, or simply getting to the correct screen in one of your apps. At the same time, press the Side button (formerly known as the sleep/wake button) and the volume up button. A thumbnail of the screenshot also appears in the bottom left corner if you want to edit it or share it right away. If you​ do, tap it. If not, swipe it off the left edge of the screen to dismiss it (it's saved either way). These instructions also apply to the iPad Pro models that were released starting in late 2018. For older iPhones, iPads, and iPod touches, check out the next sections. Get the content onto the screen that you want to take a screenshot of. Find the Home button at the center of the front of the device and the on/off button on the right side of the iPhone 6 series and up. On all earlier models of the iPhone, iPad, and iPod touch, on/off button is at the top right. Press both buttons at the same time. This can be a little tricky at first: If you hold Home too long, you'll activate Siri. Hold on/off too long and the device will go to sleep. Try it a few times and you'll get the hang of it. When you press the buttons correctly, the screen flashes white and the phone plays the sound of a camera shutter. This means you've successfully taken a screenshot. Taking a screenshot on the iPhone 7 series and the iPhone 8 series is a little trickier than on earlier models. That's because the Home button on those devices is a bit different and more sensitive. That makes the timing of pressing the buttons slightly different. You still want to follow the steps from the first section above, but in step 3 try pressing both buttons at exactly the same time and you should be fine. There's one other, potentially easier way to take an iPhone screenshot: with AssistiveTouch. This is an accessibility feature of the iOS that adds a virtual, onscreen Home button and is designed for users who have physical issues that prevent them from using the traditional Home button. Begin by enabling AssistiveTouch. Start by tapping Settings. Move the AssistiveTouch slider to on/green. In the Custom Actions section, you can choose what action takes a screenshot. Tap Single-Tap, Double-Tap, Long Press, or 3D Touch (on models that have this kind of screen). Now, when you want to take a screenshot, simply tap the virtual Home button on the screen in the way you selected in step 6 (a single tap, double tap, etc.) and a screenshot will be saved on your device. Tap the Photos app to launch it. In Photos, make sure you're on the Albums screen. If you're not there, tap the Albums icon in the bottom bar. Your screenshot can be found in two places. The easiest is in the section dedicated to screenshots. If you scroll all the way to the bottom, tap Screenshots to see a collection of every screenshot you've taken. You can also find screenshots mixed in with your other photos in the Camera Roll album. Open Photos if it's not already open. Find the screenshot in Camera Roll or the Screenshots album. Tap it. Tap the sharing button at the bottom left corner (the box with the arrow coming out of it). Select the app you want to use to share the screenshot. That app will open and you can complete sharing in whatever way works for that app.